Email me with questions, projects, collaboration proposals and more at: public@andrewringler.com. You can also find me on Twitter (@andrewringler), LinkedIn, GitHub, and Facebook. I very occasionally write about miscellaneous topics in my journal. 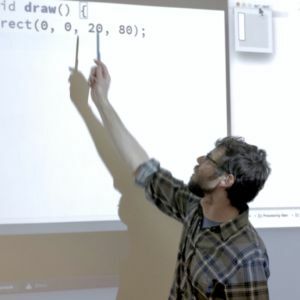 Andrew Ringler is an artist, creative technologist, educator and maker. He creates interactive public installations that allow participants to create their own novel visual and auditory experiences. He challenges participants to invest time and effort learning new systems collaboratively, through that investment receive the pride of achievement and the joy of connecting with others. Ringler’s work takes inspiration from teaching, learning, creation, science and communication. Ringler’s work often takes the form of interactive sculptural works merging wood and plastic with light, sound, electronics and computation. Andrew Ringler not only promotes collaboration between participants using his works but is an avid collaborator during the design process. Sequencing Marbles (a collaboration with Patlapa Davivongsa) has been shown in Boston galleries; it enables participants to compose music through the act of moving marbles between physical cubbies mounted on the wall. His work Draw Blocks has been shown publicly in Boston galleries; it allows participants to compose digital projected patterns through the manipulation of wood blocks on a glass tabletop. With Ringler’s work Macropavilion he travelled to Panama City, Panama to collaborate with Valeria Lalinde, Miguel Espino and Suma Architecture Group. Macropavilion is a fifteen meter diameter pavilion of aluminum, wood, fabric and LEDs providing visitors with shade from the sun in addition to an interactive canvas of lights to play with. Learning, computation and science play a strong role in the Ringler’s art. His works enable participants to create novel visual and audio results while challenging them to learn new concepts and systems of interaction. Ringler’s works are often informed by his research in computation, artificial intelligence, color perception, sound perception, language and psychology. Ringler is constantly researching scientific phenomena, human perception and technology exploring ways to communicate new concepts to the public through his art. He is currently a research affiliate at the Massachusetts Institute of Technology under Professor W. Craig Carter in the department of Materials Science and Engineering. In addition to his love of science Andrew Ringler has enjoyed filmmaking since being introduced to the craft by family friend Josh Kastorf (8th Muse) at a young age. Filmmaking led Ringler to an interest in acting then improv comedy and performance. Ringler’s love of film narrative is evident in his attention to detail when crafting interactive experiences. Through his works Ringler seeks to share the joy of performance often blurring the line between participant and performer. Such role reversals are also evident in Ringler’s teaching where he promotes self-learning, peer learning and collaboration. Ringler teaches and develops curriculums at the Massachusetts College of Art and Design and the Massachusetts Institute of Technology. His courses focus on the use of software and electronics exploring personal expression, accessibility, communication, societal impact, creation and design. In addition to teaching Mr. Ringler is an avid learner studying filmmaking, design, acting, improv comedy, drawing, dancing, trapeze, interaction design, web design and experience design. Andrew Ringler grew up on Cape Cod where he sailed, swam and tinkered with computers. He earned a Bachelor of Science with Honors in Computer Science from McGill University in Montreal, Canada. After graduating Ringler worked as a programmer and user experience designer creating environmental, biological and social software simulations. In addition to filmmaking, Mr. Ringler began pursuing interaction design and computer driven art. In 2016 he completed a Master of Fine Arts from the Dynamic Media Institute of the Massachusetts College of Art and Design. Andrew Ringler currently lives, teaches and creates art in Boston, Massachusetts. I create interactive public installations that allow participants to create their own novel visual and auditory experiences. I challenge participants to invest time and effort learning new systems collaboratively, and through that investment receive the pride of achievement and the joy of connecting with others. Through my works, I make accessible the act of creation. Taking inspiration from science, visual perception, computation and psychology my works are both approachable and challenging. I bring participants into the act of learning and of discovering new systems of interaction. I take inspiration from construction toys like LEGO. With LEGO one simple action, snapping blocks together, combined with the ability to compose any combination of blocks and the curiosity to explore, leads to infinite possibilities of creation. In my own works I use this concept of composition and exploration to enable participants to enter into a place of creation. By creating works that mix physical objects with digital objects (code) my works are able to provide a rich diversity of outputs for participants to explore; while retaining the rich sensory experience of manipulating physical objects. By leveraging simple building blocks and allowing participants to compose them, I create environments in which participants are able to create. I place my works in public places so that strangers might happen upon them and create together. When my works help to create a more connected community I am overjoyed.